Messy Church A free and fun afternoon of craft, games, songs and more followed by a meal. An all age event, must be accompanied by an adult or carer. For future dates please pick up a flyer at our reception desk. Beavers, Cubs and Scouts Fridays from 6pm, weekly in school term time. See http://www.3rdbrampton.co.uk/Release/ for more information. Brampton Social and Activities Group 10am-12.30pm, Wednesdays weekly. A lovely group of seniors who enjoy getting together for games, meals and trips out. Contact details can be gained from our reception desk. Knit and Natter 10am-12.30pm, Tuesdays weekly. A friendly group of ladies who enjoy getting together to work on a variety of craft activities. Plenty of wool, needles and ideas to share. Open group and everyone welcome. £2 per session which includes a hot drink and cake. Contact Jane on 07974 831274 for more information. Thom’s Blokes 10am til 12 noon, 3rd Tuesday of the month, a mid-week get together with activities organised to suit men of all ages. Talks, walks, outings, friendship. Suggested contribution of £2 per session. May be some extra small costs for some activities. Contact David on 01246 853741 for more information. Rendezvous – 1st Thursday of the month. A seniors lunch group, meet 10.30-1.30pm. A friendly group and open for anyone to pop along. ‘Fun, food and fellowship’. 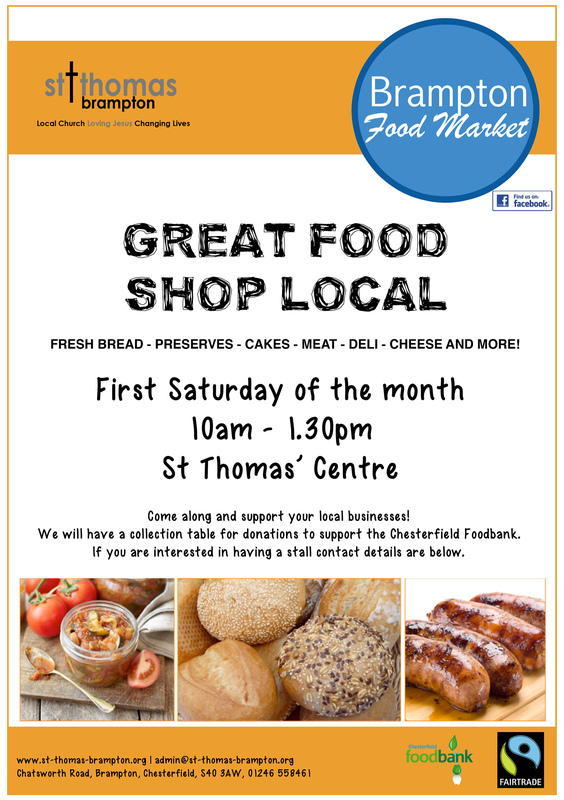 Brampton Food Market 10am-1.30pm, 1st Saturday of the month (except Jan and Aug). Local small businesses come to sell their delicious produce. Not to be missed!